Happy Monday Y’all! I hope you had the best weekend celebrating the lovely ladies in your life and if you are a mother, I hope you had a fabulous day as well!. With Spring in full bloom and wedding planning in full gear for many beautiful brides-to-be, it seemed the perfect time to wrap up one of our mini “how-to” series. In Part 1 of the Easy DIY Flower Arrangement series we learned how to create a boutonniere with baby’s breath, roses, or any other small flower. In Part 2 of the series, we focused on making a floral centerpiece (ideal for a wedding, bridal shower, baby shower, or any special event). The centerpiece created was a baby’s breath ball which was displayed on a mercury silver candlestick for an elegant vintage-inspired flare. 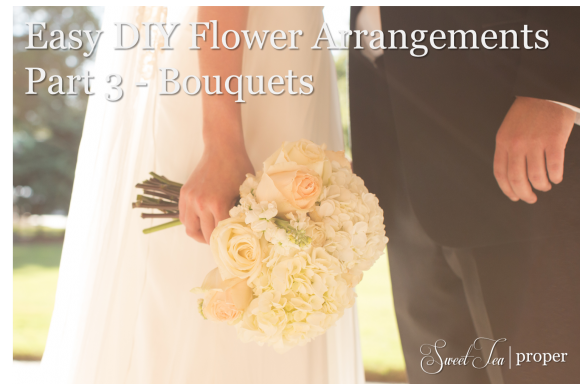 For the final article of this series, we will give you the basic step-by-step directions for creating DIY wedding bouquets including the bride’s bouquet, bridesmaid’s bouquets, and flower girl bouquets. 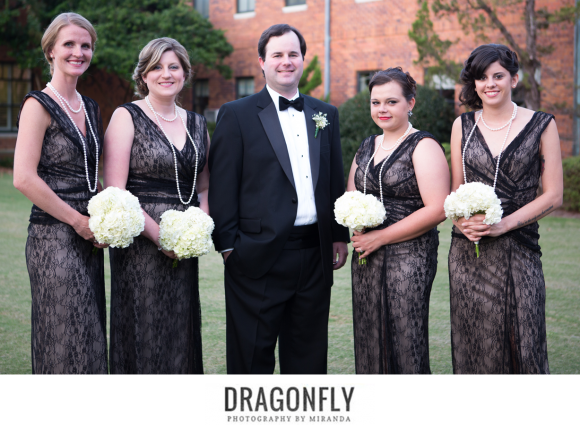 The number of ladies in your bridal party will determine the number of bouquets required for the big day. For our wedding, we wanted to go with something simple, but elegant. We chose to use only white, cream, and ivory for our wedding flower colors which made the flower selection easy, but limited. 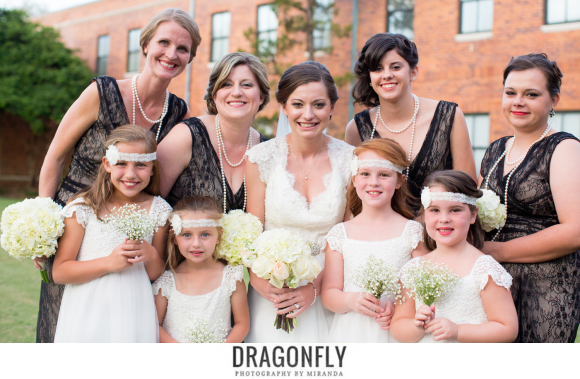 With four bridesmaids, four flower girls, a bridal bouquet, and toss bouquet needed, there was plenty of work to do for these two hands. For this tutorial, we will begin with the bride’s bouquet. It requires the most flowers and is the most difficult to assemble. Since it is the “bride’s big day”, it is arguably the most important. To make the bride’s bouquet in the picture above, the key is to add flower’s in while keeping the bouquet rounded. Professional florists do not require rubber bands in their floral arrangements, but if you are going to make your wedding flowers yourself, it will be helpful when you only have two hands to work with. If you haven’t already, cut the ends of each stem at an angle and place in water. You will want the stems to be around 8 – 10 inches. Bouquets are best made the day-of the wedding or special event, but can be made the day before and stored in a cooler or refrigerator. With its large round blooms, hydrangeas make for an easy and beautiful filler for bouquets. The hydrangea comes in a variety of colors so it works with many different styles and color schemes. 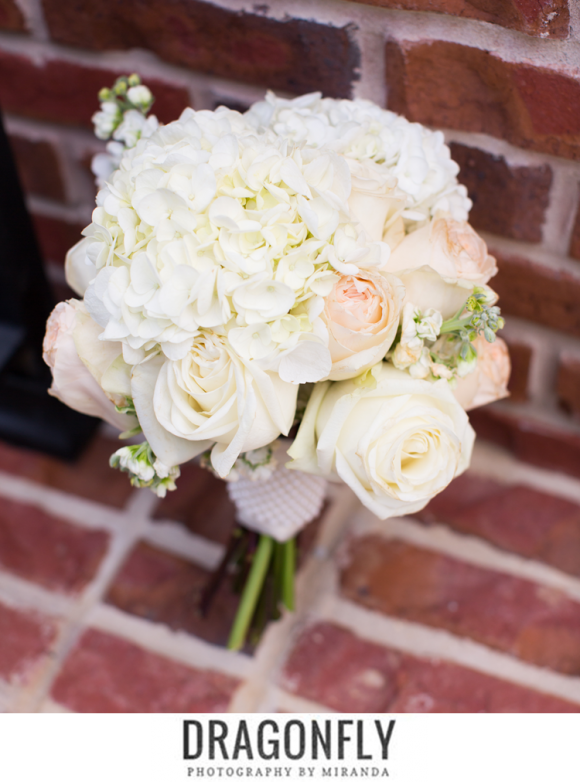 Keeping with the all-white color scheme, we used an ivory hydrangea, but the blush or blue blooms are definitely on the “favorites” list. Begin with 2 of the hydrangea blooms and hold the stems together in one hand. Add in 3 of the garden roses and 3 of the regular roses. To keep the bouquet rounded spread, add the roses one at a time filling in any empty spots.Take a rubber band and wrap the stems at least twice over. Do not worry if they stems are too long at this point, we will cut them down later. If you are having trouble keeping the bouquet rounded (this is the hardest part), add the third hydrangea. This should give the bouquet 3 points to work with. Fill in the bouquet with the remaining garden roses, roses, and stock. At this point, the bouquet should be getting pretty heavy and can be difficult to work with. When you are satisfied with the way the bouquet looks, take the another rubber band and wrap all of the stems together. The rubber band should be in the middle point of the stems and as flat as possible. Hold the bouquet in your hands where it feels comfortable. Move the rubber bands up or down where it will not be visible with your hands clasping the stems. Using the scissors (if you don’t have floral scissors, garden sheers will work just fine), cut the bottom of the stems so that the stems are even and the bouquet length is comfortable to hold. Starting at the top of the stems (closest to the flowers in the bouquet), take the floral tape (we prefer green, although it also comes in white) and wrap the stems from about 1 inch from the rounded bouquet down to 3 inches up from the bottom of the start of the stems. Wrap the stems with at least two layers of floral tape making sure to completely cover the rubber bands. This step should make the bouquet feel secure when holding it. Now for the finishing touches, using the ribbon, wrap the stems at least once over covering the floral tape. Taking the pins tuck in the ends of the ribbon and press the pin through the ribbon and into the stems. The pins should be secured in the base of the bouquet without any sharp ends visible (ouch!). If you are using diamonds, pearls, lace, or other decorative features, it can be added at this time. There you have it, the first bouquet for your wedding. If you feel overwhelmed (I know I did! ), take a breath, have a glass of water, and know that the hard part is out-of-the-way. Take your completed bouquet, place it in a vase with water, and put it in a cool spot (preferably a cooler) until it gets closer to wedding or picture time. For these bridesmaid’s bouquets, we decided to use a single type of flower – the hydrangea. Making all of the bouquets myself (with zero experience prior to this), an easy to make bouquet was the biggest requirement. As stated above, one of the reasons hydrangeas make for a great flower for the DIY floral arrangement is its ease in making a rounded bouquet. To make a hydrangea bouquet, start by cutting the stems to around 6 – 8 inches. If the blooms are large, you will probably only need to use 3 per bouquet. If the blooms are smaller, 4 hydrangea blooms will make for a sufficient sized bridesmaid bouquet. Since you will only be using 3 – 4 stems, a rubber band is not necessary to hold the bouquet together. In one hand, hold the 3 or 4 hydrangea stems. Beginning around an inch from the top of the blooms, take the floral tape and secure the stems together. Wrap the floral tape to about 2 – 3 inches from the bottom of the stems. Continue wrapping the stems until the bouquet feels secure. Cut the ends of the stems so that they are even on the bottom. Finish the bouquet by wrapping ribbon over the stems completely covering the floral tape. Take at least 2 floral pins and secure the ends of the ribbon in place. *Please Note: Hydrangeas can brown quickly if left out of water or in the heat. It is recommended to make these the day-of if possible. Place the completed bouquet in a vase with water and store in a cool place. Who says a flower girl has to carry a basket and sprinkle rose petals? Not us! 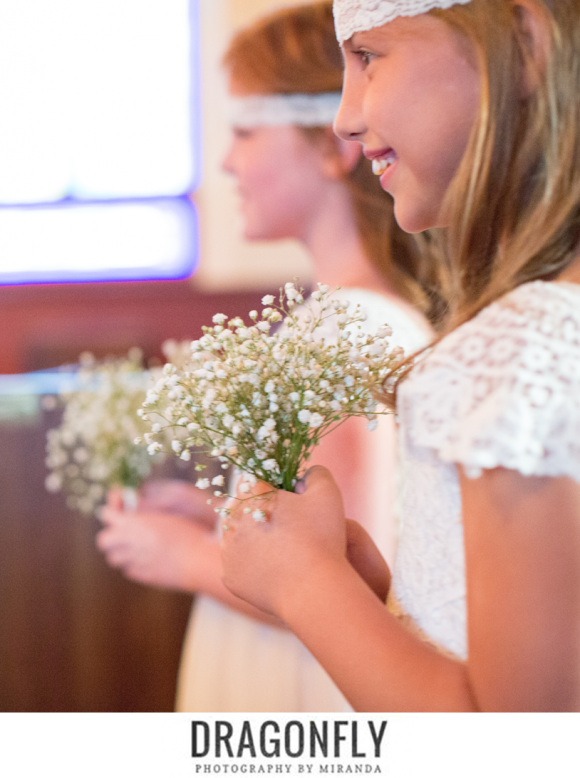 Between church regulations banning real petals, the cleanup required after the ceremony, and having to work with younger flower girls on proper sprinkling behavior, we decided to opt out of the “sprinkling of the roses” and go for a simpler method. As with the bridesmaid’s bouquets, we decided to use a single kind of flower for the flower girls bouquets. The light and airy baby’s breath were the perfect choice for little hands. Since little hands will be holding the flower girl bouquets, the stems will only need to be around 5 inches long. Baby’s breath stems can be flimsy, so pick three that are in good shape. Taking the scissors, cut the stems down to 5 inches. Hold the baby’s breath stems in one hand and wrap the center of the stems with the floral tape. The stems are small so this should be easy. Tear off the floral tape and press the end down securely. We opted out of using ribbon for these bouquets because the girl’s hands would be covering up the floral tape, but this is where you would want to add a layer or two if you prefer. Our flower girl’s were 5, 6, and 8 years old and they handled these bouquets with ease. It also tied in the baby’s breath that we used throughout the ceremony and reception so it made for a perfect fit. If you have any questions on how to make one of these bouquets, feel free to e-mail us or ask us in the comments section below. Good luck!